Rev. 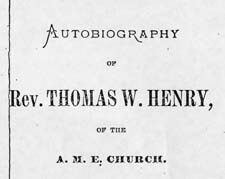 Thomas W. Henry, 1794-1877 Autobiography of Rev. Thomas W. Henry, of the A. M. E. Church. Autobiography of Rev. Thomas W. Henry, of the A. M. E. Church. African American clergy -- Maryland -- Biography. African Methodist Episcopal Church -- Maryland -- Clergy -- Biography. Circuit riders -- United States -- Biography. Methodist Church -- Maryland -- Clergy -- Biography.